Rothenburg ob der Tauber, Bavaria, Germany. Although the four buildings which today comprise Hotel Eisenhut all date from the 16th century, the hotel itself has only been in existence for little over a hundred years – it was in 1890 that Georg Andreas Eisenhut opened a wine tavern in Herngasse no. 3, which later began to offer accommodation to travellers. However, since welcoming visitors it has certainly seen many famous names pass through the doors. These, it should be said, are all of the twentieth century, and include individuals such as King Carl XVI Gustav and Queen Silvia of Sweden, the actor Gert Frobe (most famous for playing Auric Goldfinger in the film of the same name), and Willy Brandt. That said, historic icons such as Sir Winston Churchill and William Randolph Hearst have also sojourned at Hotel Eisenhut. Today it offers over 70 guest rooms (including two suites), each of which are individually decorated and furnished. 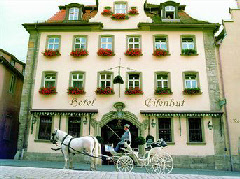 It also features its own restaurant which specializes in Franconian cuisine, and a piano bar. Four star rated, Hotel Eisenhut is ideally located for those wishing to explore Rothenburg-ob-der-Tauber on foot, with the Marktplatz, Town Hall and the Ratsherrntrinkstube all nearby.